The Bicycle Coalition of Greater Philadelphia held a series of ‘car counts’ last month, to start the data gathering practice pertaining to Spruce and Pine Streets through Center City. As many know, Spruce and Pine Streets are not safe enough and there is a plan to switch the bike lanes from the right to the left, and protect the intersections, since right hooks are, currently, the most prevalent type of crash between cyclists and drivers on those streets. But here’s the thing: Spruce and Pine Streets are also the most abused bike lanes in the entire city. The Philadelphia Parking Authority hands out more tickets for motor vehicles parked in the bike lanes on those streets than anywhere else. That’s a problem. 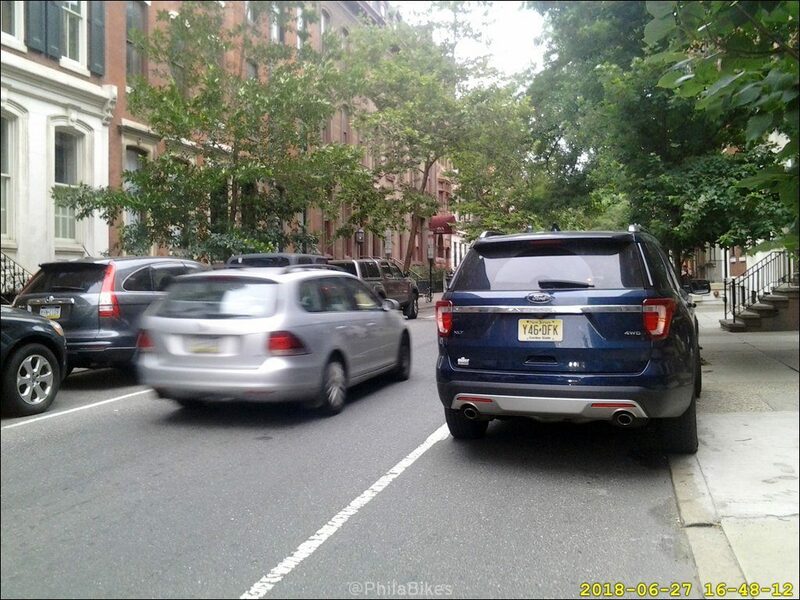 To make matters worse, most of Spruce and Pine Streets through Center City are “No Parking” zones—which means motor vehicles are allowed to pull into the bike lane and impede the hundreds of cyclists who use these lanes each hour, with impunity. The fact that stopping in the bike lane is allowed, and the PPA is still handing out more tickets here than anywhere else should set off alarms for anyone who cares about traffic safety. The Bicycle Coalition believes the city’s current plans around these streets—which have been delayed to Spring 2019—do not go far enough. So, in order to figure out how many cyclists are being impacted by people pulling over their motor vehicles into the bike lane, several volunteers went out between August 15 and 21 to count the number of cars using the bike lane to pull over, as a loading zone, or to park, along 900 Spruce St., 1200 Pine St., and 1500 Spruce St. These counts took place for one hour in the morning and one hour in the afternoon. This was not a scientific study. But what those volunteers found was predictable. Why is this impactful? Because our latest bike counts, from 2017, show hundreds of cyclists per hour along these streets. At 13th and Spruce, for instance, there was an average of 326 bicyclists per hour during rush hour. At 10th and Pine, there were 241 bicyclists per hour during rush hour. So, in addition to the number of motorists breaking the law by overstaying their 20 minute limit (which is an outdated part of the law that created these bike lanes), most cyclists are running into and having to bike around legally-parked motor vehicles during rush hour on Philadelphia’s most-cycled streets. We will continue these counts after the city conducts its treatments of Spruce and Pine Streets in the spring to see what, if any, impact, the re-striping and intersection protection has on motorist behavior. This is just the beginning of our look into this issue. Stay tuned for more information, including ideas, solutions, and information from cyclists who use these streets. Why is there no mention of the dozens of cars parked in the bike lanes every Saturday and Sunday along Pine and Spruce for religious services?